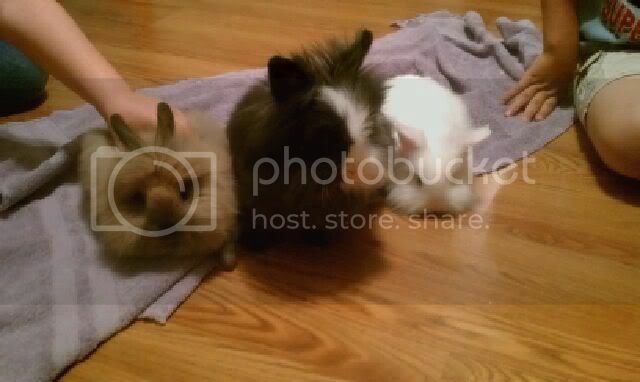 After much reading and research, we took the plunge and bought 3 pet rabbits on Saturday. They are all Lionheads, one white buck with violet eyes, one VM doe with blue eyes, and one orange doe. The VM and REW are half brother & sister and are pedigreed. They are so sweet and mild-mannered. We are in love! I see more in our future! I love the VM doe! She's adorable. The "orange" isn't an orange, it's tort or blue tort (looks more tort here though). See the dark shading? With an orange you would see agouti markings (white belly, white around eyes, nose, white inside of ears, ect.) instead. Thank you for that correction sid! I learn so much at RT! How old are your Lions? The black tort looks to be a double mane. My fav. Pink, they are 8 weeks old. Pretty Lion heads. Have two myself. Both are sweet and love their personalities. My boy Neville, who's now 6 months old, is just so laid back. Luna, now 5 months, is just so curious, and "in your face". How are they all getting along? Hope all is well.